Striking journalists have voted to extend their action for a further five days claiming they have been “rebuffed at every turn” over a planned newsroom restructure. Members of the National Union of Journalists at Newsquest South London made the decision while on the picket line during the third day of their current strike yesterday. The industrial action was scheduled to last one week and had been due to finish on Wednesday, but the group’s chapel has now announced the extension, claiming alternative suggestions for a new newsroom structure have been rebuffed. The extended action will be held from next Monday to next Friday. Newsquest says it will continue to publish and has urged the union to reconsider. By law, the union has to notify the company at least seven days in advance of any action, meaning they will return to work this Thursday and Friday after the current strike ends. Up to 11 jobs are set to go in a restructure in the capital, which saw 27 out of 29 staff at South London-based newspapers put on notice of redundancy. The NUJ says seven journalists have resigned over the plans, with the group’s sports team, leisure editor and three news editors due to leave the company on Friday. The union further claims talks at arbitration service ACAS have already stalled. A chapel spokesperson said: “Our centre’s annual cost has dropped by about £380,000 since March, because departing journalists have not been replaced and photographic coverage has been slashed. On top of that, Newsquest wants to save more than £250,000, and has simply refused to negotiate. “Our strike continues and our resolve is undiminished. All we want is to report the news and celebrate our communities. We totally reject Newsquest’s plan for reduced coverage and generic content that will rob local communities with the news and features relevant to where they live. 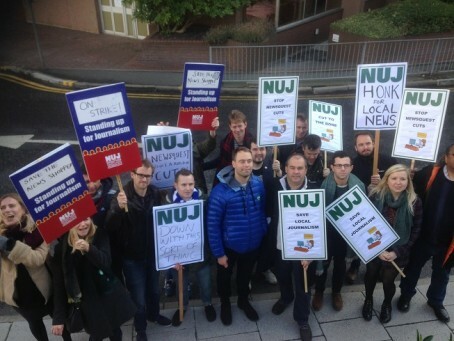 A Newsquest spokesman said: “It’s disappointing that the NUJ are extending their strike action – especially as they are fully aware of the trading position of the South London newspapers, and the need to reduce their cost base to ensure a sustainable future. “During talks the NUJ and its members were invited to discuss, review and propose a workable structure within a reduced cost base which they have failed to do, sadly as a result talks broke down. “Clearly it is regrettable that this restructuring placed a number of roles at risk of redundancy, but we have done this to ensure that the South London business – which is made up of free newspaper titles -has a credible future.